So, I watched The Deal again. It felt strange, like a series of stepping stones back through the decades: watching in 2015 a drama from 2003 about events from 1994 that had their roots in the early 1980s. Indeed, after a brief bit of scene setting, The Deal begins with a flashback to archive news footage from Labour’s early 80s nadir: Margaret Thatcher in the full flush of her Falklands triumph, waving on some military hardware; Michael Foot in his donkey jacket at the Cenotaph (plus ça change, plus c’est la même chose). There are twelve years between these events and the famous pact between Gordon Brown and Tony Blair, made swiftly in the wake of John Smith’s death, that set Labour up for government. Twelve years have passed (almost to the day!) since Channel 4 first broadcast the drama and last weekend’s election of Jeremy Corbyn as leader of the Labour Party. Is this how it ends? These recreations of recent-ish history have now become regular TV fixtures – most recently we had Bertie Carvel as Nick Clegg in Coalition. But The Deal set the template of imagined scenes of what might have happened behind closed doors. Writer Peter Morgan is not really interested in the politics, using news snippets to sketch in the big events: Neil Kinnock facing down Militant (a Labour council! a Labour council! ); the hubris of the Sheffield rally (We’re alright! We’re alright! ); the murder of James Bulger, (Tough on crime, tough on the causes of crime). History as soundbite. 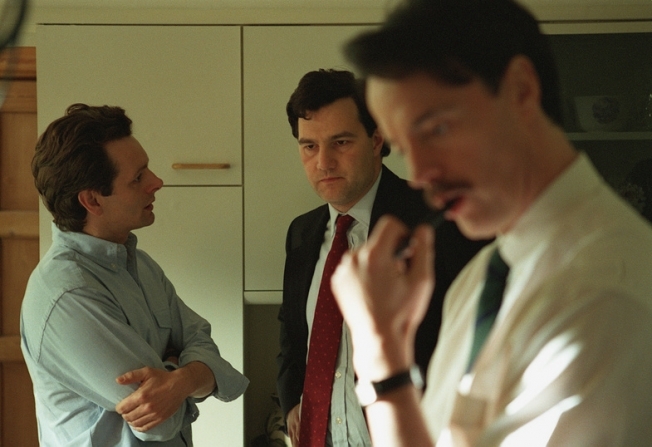 Instead, the focus is close up and personal, on the shifts in the central relationship that came to define New Labour. The Brown-Blair dynamic is irresistibly dramatic, Sophoclean, Shakespearean: the apprentice who turns on his master; the pretender destined for greatness but weakened by fatal hesitation; Michael Corleone meets Hamlet. But there are ironies even beyond those of classical tragedy. These past 12 years on have given us privileged knowledge, reshaping our reactions: we know what happens next, Peter Morgan doesn’t. Consider Scotland. In The Deal, the Scots are presented as the party establishment, male and clubby, presided over by the fatherly John Smith, while news clips remind us of Robin Cook and Donald Dewar. An early scene shows us Brown, victorious at his declaration in the ’83 election that first brought him to Westminster, trouncing an anonymous, female SNP candidate who only managed about 2,000 votes. Earlier this year, the SNP secured more than 27,000 votes in Brown’s old constituency, beating Labour by 10,000. But in The Deal, Brown’s Scottishness forms part of his eligibility, marks him out as one of the elect. Blair’s non-Scottishness (“you walk English,” Brown tells him) marks him an outsider in the party, someone who will never properly belong. In their first row over the leadership, Blair points out that he can carry the English south. I can carry the North and Scotland, retorts Brown. “Scotland is irrelevant!” shouts Blair. Ah, the irony. The Deal gives us very little sense of the wider party machine, and isn’t interested in showing us the difficult and messy and sometimes tortuous business of policymaking and horse trading and briefing and spin and counter-spin, despite enjoyable cameos from Paul Rhys as Peter Mandelson and Dexter Fletcher as Charlie Whelan. Ed Balls also appears briefly, played as a skinny, speccy SPAD by some jobbing actor, not the bruiser he would become. 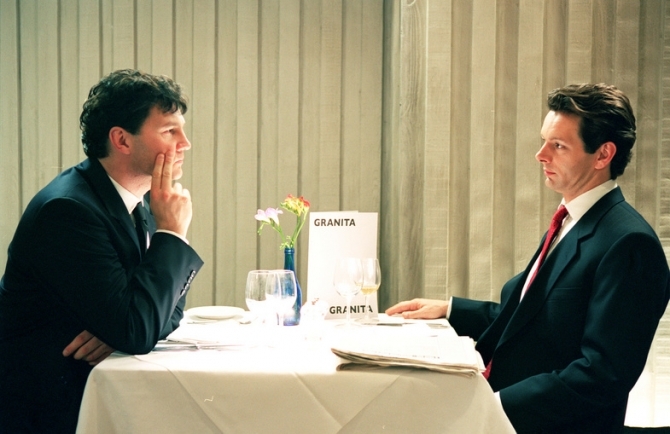 Even the ultimate political trade off, The Deal itself, the pow wow in Granita over Blair’s rabbit and polenta, is portrayed as a relatively short, perhaps 10-minute conversation that’s not that difficult for either party. Of course we have had The Thick Of It in the intervening twelve years, Armando Ianucci’s brilliant and hilarious skewering of New Labour’s modus operandi. It was a surprise, and another delightful irony, to see Joanna Scanlan – The Thick of It’s Terri Coverley – in a tiny role as Gordon Brown’s assistant Sue Nye. It was Sue Nye of course who brought Gordon Brown face-to-face with Mrs Gillian Duffy in Rochdale, she went on about immigrants, he called her a bigot as the car drove away, the mic was still on, you know the rest. It was an episode that out thick of it-ed The Thick of It. 2003, the year The Deal was broadcast, was also the year the shine really wore off New Labour. The year of the Iraq invasion and the dodgy dossier and the suicide of Dr David Kelly (subject of a later recent-ish history drama, Mark Rylance played Kelly). Despite the timing, there’s a larky indulgence to The Deal: it closes on a close-up of the real Gordon Brown, smiling awkwardly, with a caption saying he is still waiting his turn. He doesn’t yet know how his chalice has been poisoned. Not just Iraq. The economy and the City were booming back in 2003. Gordon does not know what all those credit default swaps had in store for him. The last few days have brought fast-moving and fresh dramas for Labour. Peter Morgan is perhaps sharpening his pencils even as the disciples of Tony and Gordon sharpen their knives. I vote Suranne Jones for Liz Kendall. Larry Lamb is a shoo-in for John McDonnell. I’m open to suggestions on Corbyn. As we wait for this particular chapter in the story to play out, you could do worse than go back to Granita.